I just knocked some serious food doing out, everybody. I’ve talked before about how much I love our Community Supported Agriculture box, but it’s rare that I just rip into it and start making up deliciousness. We have a thing at my kid’s school where they have a parent take home the school CSA box and prepare some fun food for the kiddos so they can see how something goes directly from farm to table. This week it was my turn. Hooray! Yes, I do feel crazy for saying hooray but it’s kind of like being on “Chopped” when you can be all “I’ve got some collard greens, one egg, and a box of chocolates. GO.” I love it. LOVE. So I came home after being stuck behind some craziness on the 405, put the kids to bed and opened up that freshness you see above, then I went to town. 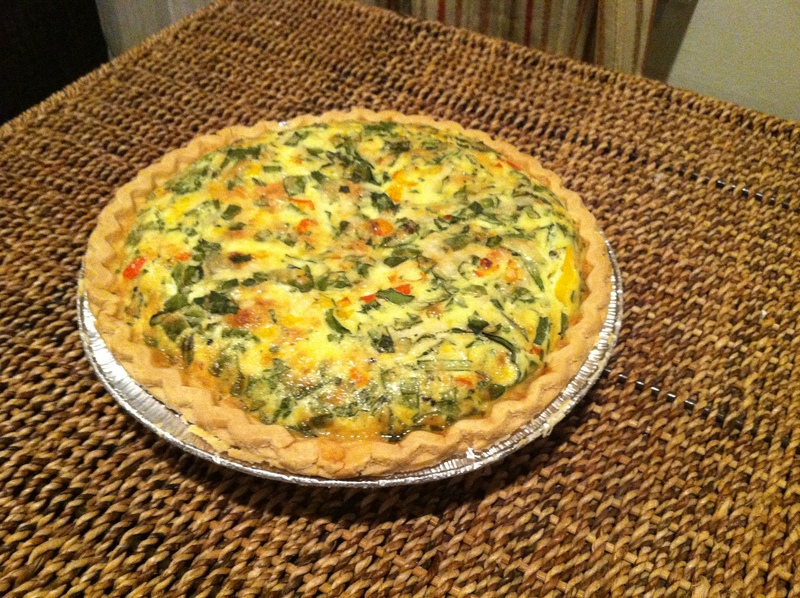 First up, it’s a red, yellow, orange pepper and collard green gluten-free quiche! I took my recipe that I LOVED with the leeks and the bacon, and cut back on the cheese, and cut up 5 mini bell peppers of varying colors, and diced up three large collard green leaves. Prepped the same way, it turned out gorgeous. Gorgeous! I do have a feeling this will be more popular with the teacher than the kids, however. Oh hey, I just made some PLUOT ROSEMARY JAM. Now, I don’t like jam. And I am still not totally clear what a pluot is, exactly. So I had to have my husband taste it and explain its appeal. It’s the first time I’ve even made jam, which is so weird because every woman in my family is basically a canning expert. I just have always avoided cooked fruit, be it jam, pie, or on ice cream. Don’t like it. Like it fresh. But hey, this was kind of cool. Not as gorgeous, but still delish, I made homemade tomato sauce and grated up some Parmesan and made some gluten-free spaghetti so the kids could have some lunch that looked pretty familiar. Also a good lesson. 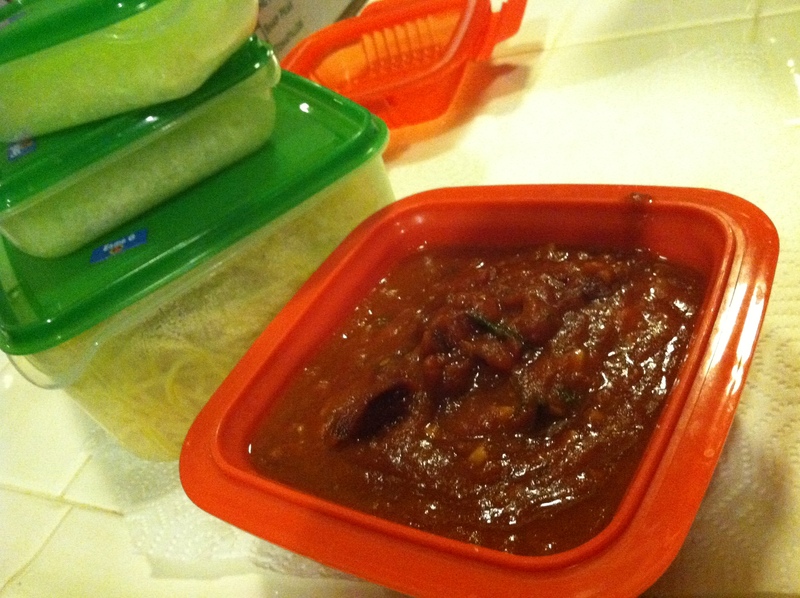 Spaghetti sauce comes from the garden, little dudes and dudettes. That’s the truth. 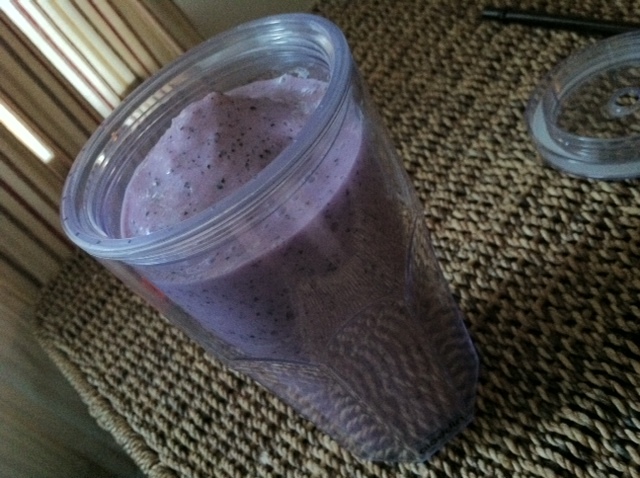 And a big crowd-pleaser, the gluten-free grape smoothie. Now, this only made one big serving, so those kids are going to have break out the Dixies to enjoy a taste, but still, FUN. 1. Combine pluots, honey, balsamic vinegar, lemon juice, rosemary, salt and pepper and medium pot over high heat. Bring to boil, stirring frequently. Turn heat down to low and cook for 20 minutes, stirring intermittently until fruit is completely broken down. 2. 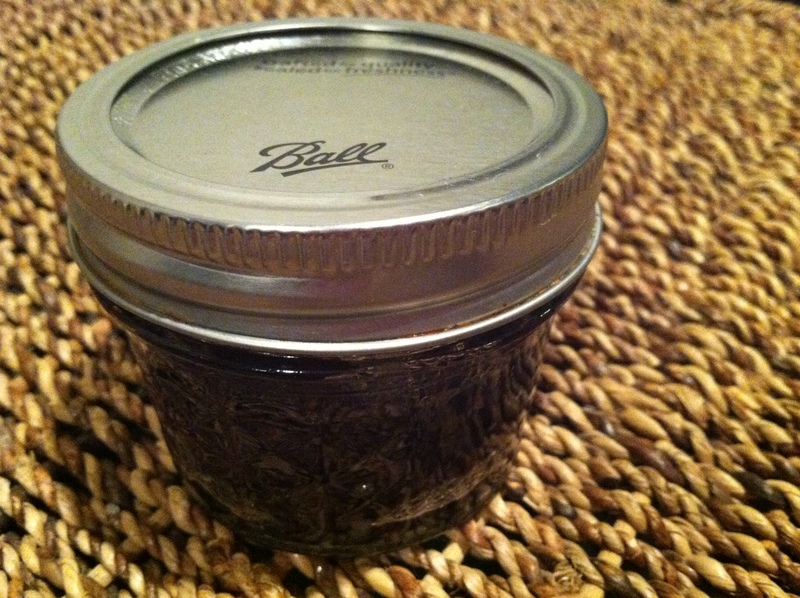 Remove from heat, allow to cool, and transfer to jam jar. 1. Score tomatoes, and put water on to boil. When water is boiling, boil tomatoes for 2 minutes, then remove and put immediately into cold water. Peel skin off tomatoes, and core. Dice tomatoes into small pieces. 2. In a medium skillet, heat olive oil then add garlic and red chili pepper flakes. Cook for 2 minutes, then add onion and allow to brown for at least 2 more minutes. 3. Add diced tomatoes to skillet and cook on medium-low heat for 15-20 minutes or until desired consistency. 3 minutes before you remove from heat, add parsley and basil and simmer. Serve over pasta or whatever the heck you like. 1. Combine grapes, yogurt and ice into blender and choose puree setting. Add more ice if more liquid is needed. Blend until smooth. Tags: gluten free recipes, gluten-free csa, gluten-free jam, gluten-free organic, gluten-free quiche. Bookmark the permalink. Those sound delicious! Thanks for your blog. Your GF Quiche is beautiful! 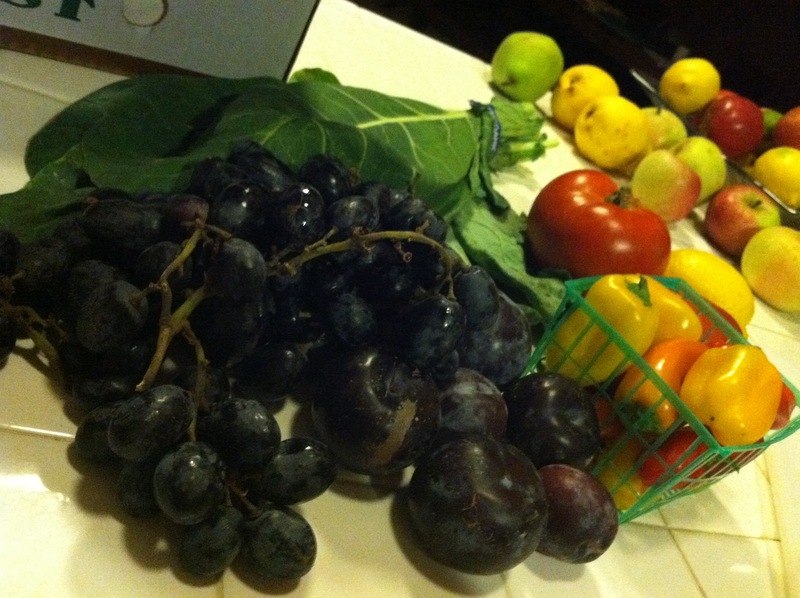 I used to volunteer for Food Not Bombs and I loved working with whatever random ingredients we would get. Lovely blog. I’m very impressed! Love that quiche and I bet my kids would be all over that smoothie. I just found your blog after going gluten free for my auto immune disease- not only have I stopped crying, (literally in the aisle at the grocery while realizing how many things gluten is in), but I have started laughing and cooking awesome stuff! All because of this blog and you! Thank you so much! I made the sea salt caramel popcorn balls last night and they were a huge hit at my party today! I LOVE your sense of humor- thank you!